All fires can be very dangerous and life-threatening. Your safety should always be your primary concern when attempting to fight a fire. Before Deciding To Fight A Fire, Be Certain That . . .
You know your fire extinguisher works. Inspect extinguishers once a month for dents, leaks or other signs of damage. Assure the pressure is at the recommended level. On extinguishers equipped with a gauge, the needle should be in the green zone—not too high and not too low. Be sure to watch the area for a while to ensure it doesn't re-ignite. Aim at the base of the fire, not the flames. This is important—in order to put out the fire, you must extinguish the fuel. Sweep from side to side. 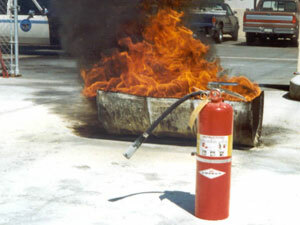 Using a sweeping motion, move the fire extinguisher back and forth until the fire is completely out. Operate the extinguisher from a safe distance, several feet away, and then move towards the fire once it starts to diminish. Be sure to read the instructions on your fire extinguisher—different fire extinguishers recommend operating them from different distances. Remember: Aim at the base of the fire, not at the flames!!!! A typical fire extinguisher contains 10-15 seconds of extinguishing power if fully charged. Always read the instructions that come with the fire extinguisher beforehand and become familiarized with its parts. Once the fire is out, don't walk away! Watch the area for a few minutes in case it re-ignites. Recharge or replace the extinguisher immediately after use. You don't have the proper fire extinguisher. The wrong type of extinguisher can be dangerous or life-threatening. Any sort of fire will produce some amount of carbon monoxide, the most deadly gas produced by a fire. Materials such as wool, silk, nylon and some plastics can produce other highly toxic gases such as carbon dioxide, hydrogen cyanide, or hydrogen chloride. Beware—all of these can be fatal. It is recommended to have at least one fire extinguisher on each level of your home. Keep them in plain sight and no more than five feet above the floor. Do not put them in closets because that will cost you valuable time when you are reaching for it. And even though a fire extinguisher may not match your décor, do not hide it behind curtains or drapes. The most important places to have a fire extinguisher are in areas that are more susceptible to fire. These areas are the kitchen and the garage. 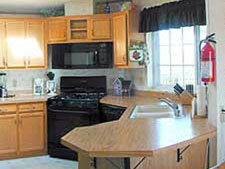 Kitchen: According to U.S. Fire Administration statistics, the kitchen is the place where fires most often start. You should not have to risk burns just to reach your extinguisher. Therefore, the best place to put the fire extinguisher is by the kitchen door so you have easy access to it. Note, however, that an improperly used fire extinguisher can spread a grease fire in a frying pan. Instead, simply slide a lid on the pan, turn off the heat, and allow it to cool. If no lid is available, use a larger pan, a cookie sheet, or pizza pan. Garage: It is a good idea to keep a fire extinguisher here because in most homes, this is the place we use as storage. Often, leftover paints, solvents, and building materials will be piled up without a second thought. Again, the best location to mount the fire extinguisher is by the door. Inspect fire extinguishers at least once a month : The extinguisher is not blocked by equipment, coats or other objects that could interfere with access in an emergency. The pressure is at the recommended level. On extinguishers equipped with a gauge (such as that shown on the right), the needle should be in the green zone—not too high and not too low. Information provided by Fire Extinguisher: 101 Web site.